Seville – Network Network Network! GoBike co-convenor Iona has recently returned from a beautiful trip to sunny Seville – a city that has been crowned by some, as the fourth most bicycle friendly city in the world. And what she found was a cycle network, a not always perfect network, but a fully linked up, joined up and functional… network. The cycling network in Seville was put in very quickly. In 2005 the city had a steady rate of a very low 0.5% of people using cycling to get around. That’s even lower than we have in Glasgow, where the modal share sits at around 1.2% (Cycling Scotland Annual Cycling Monitoring Report 2017) . Due to a combination in Seville, of a change in political will, favouring a better way of moving people around the city, and a big social movement (see the A Contramano cycle campaign), the next four years saw 80 miles of traffic free, linked up cycle lanes installed in the city, with 50 miles of that going in in the first year. And guess what? Since then the modal share has increased to 6%, over the space of just six years. And 35% of those cycling are women, a remarkable statistic that has been attributed to the separation from traffic. They built a network, and because it went places, people got on bikes and started to use it. The network tends to a continuous green, always with curb or obstacle separation from traffic, and sometimes with physical separation from pedestrians, or if not, with a difference in surface or buttons. And where did the space for the bike lanes come from then? By using road previously used by traffic – car and bus lanes and very often, parking. What is remarkable about the network is the speed at which it was put in. Many of the design features are quick to install and temporary. Plastic pavements, metal buttons and armadillos all feature. Perhaps as a result of the lanes going in so quickly, the network is not perfect – some stretches do share the cycling space with pedestrians, the lanes can be quite narrow with tight corners, and almost all of the lanes use bi-directional travel. However, a safe and linked up space for cycling has been created, a traffic free space safe for people of all ages and abilities, and with this space they now have the ability to work on the base of the network, to now improve it’s quality. Be assured that the designers of the network are not resting on their laurels now that they have their increase in modal share. They are currently hard at work to improve the quality of the lanes, and add paths to other neighbourhoods, with a vision now to double their 6%. But remember, this all started by first creating a network. So what can we learn from this in Glasgow? Well, the secondary part of the new scheme in Seville was complimented by a bike share scheme. 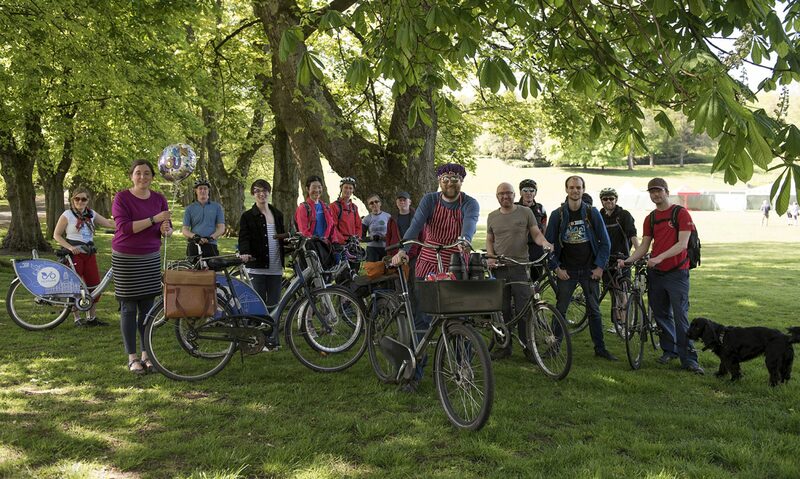 We do have a fairly decent one in Glasgow, and we also have some short lengths of safe cycling infrastructure, slowly but surely going into the ground, but what we don’t have is a network that is linked up. That is the key to our desperately low cycling modal share. And what we rarely do here is to create space for cycling by removing space from the car. On top of that, we don’t build quickly, in fact we build extremely slowly. Glasgow desperately needs the vision of a linked up network, aimed for the short term, and one that political will can press through at the speed we desperately need it ramped up to. If we take one thing from Seville, let it be the proven effect of creating a safe and traffic free, linked up network. From that, we can build further and improve the quality, but let’s start with a network. For further interest, these films delve a little deeper.